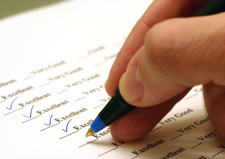 Fining Homeowners for not Completing HOA Surveys? Asked – May our HOA impose fines on homeowners who fail to complete HOA surveys? Answered – Probably not. In general, a homeowners association (HOA) does have the authority to impose reasonable fines to deter violations of the HOA’s governing documents, as well as any rules and regulations validly adopted by the HOA’s Board of Directors. Liebler v. Point Loma Tennis Club (1995). Even assuming that the survey requirement itself is a reasonable, valid rule adopted by your HOA Board in accordance with the requirements contained in its governing documents and Civil Code §1357.110, fining homeowners for failing to complete the survey is likely to be deemed an unreasonable exercise of the HOA’s authority. The HOA’s authority to impose fines is premised upon (1) deterring behavior which may damage the interests of the HOA and its members, or (2) reimbursing the HOA for costs it will incur as a result of violations. A homeowner’s failure to complete an informational survey will rarely, if ever, implicate such concerns. The imposition of disciplinary measures such as fines is often crucial to the success of a HOA’s enforcement efforts. However, the authority to impose fines is not absolute–HOA Boards must comply with the procedural requirements set forth both in their governing documents and the California Civil Code, and furthermore must ensure that the fines at issue are justifiable and reasonable under the circumstances.